Fr Ralph de Hahn: Was Resurrection a real deal? The editor and staff of The Southern Cross wish all readers, advertisers, Associates, pilgrims, supporters, contributors, bishops, clergy, religious, and all our friends a blessed Easter filled with the hope and joy of our Risen Lord. AZARETH Care Centre in Yeoville, Johannesburg, has closed its HIV/Aids clinic and hospice after receiving notice that the Gauteng Department of Health will be withdrawing financial support as of March 31. The clinic catered for over 2 000 patients from the local community where anti-retroviral treatment was available for people with HIV/Aids. Patients were also given drug literacy training, received ongoing counselling, and had access to doctors and nurses who could treat the opportunistic infections they might also have. “All patients have been transferred to other care facilities or to the care of loved ones. These facilities—Alexandra Hospice and Edenvale Hospice—were selected by the Department of Health,” said Nazareth Care African region’s Wayne Devy, CEO. In addition, the harsh reality of closing a department means that Nazareth House is in the process of staff retrenchments. are helping the fight against this epidemic, and will continue to work alongside the Catholic Health Care Association which provides training in HIV/Aids support and anti-retroviral adherence monitoring,” Mr Devy said. Nazareth Care’s children’s home, elderly care and charity shop remain unaffected by the government cut. An ongoing need remains for these facilities, said Mr Devy. As winter approaches, Nazareth Care requires dressing gowns, slippers and socks, and basic toiletries for its residents. “We would like to thank our community for their words of encouragement to our staff, management, and patients,” Mr Devy said. “We will never give up on the cause. Please keep our HIV/Aids patients, carers and hospice staff in your thoughts during this difficult time.” Nazareth House, founded by the Sisters of Nazareth, is a non-profit, charitable organisation that has served communities in South Africa for more than 130 years. Top Witbank diocese student Itumeleng Mohlala (centre) and parish priest Fr Jereme Soku MCCJ (left) receive awards from diocesan youth coordinator Mthunzi Manda. ITBANK diocese has honoured its best 2018 Grade 12 student, Itumeleng Mohlala from Acornhoek. Ms Mohlala—currently studying at the University of Limpopo—won a trophy from the diocesan youth ministry and a floating parish trophy, plus a book voucher donated by Phemphetse Trading & Projects and cash from Honestytrade 40. Diocesan youth coordinator Mthunzi Manda presented the awards and prizes to Ms Mohlala, and Fr Jereme Soku MCCJ received the floating trophy on behalf of the parish. Mr Manda thanked the two companies for their contributions,and invited businesses that could help Ms Mohlala further her studies to contact him on 082 297-4087. AINT Mary’s parish in Retreat, Cape Town, hosted the final profession of Redemptorist Brother Peter Chitabanta. Br Peter was supported by a large congregation which included his Redemptorist confrères and friends from his native Zambia, Brs Paschal Chola, David Busiku and Flavio Musonda (all Brothers of Charity). Fr Gregory Vu Tung, a Redemptorist from Vietnam, travelled with the Zambian Brothers from their base in Limpopo. Also in attendance were members of the Little Family from Retreat who have been longtime friends of Br Peter. The new provincial of the Redemptorists in South Africa, Fr Gerard McCabe, delivered the homily at the Mass. Newly professed Br Peter Chitabanta CSsR with Redemptorist provincial Fr Gerard McCabe. weekend-seminars on July 13-14 and July 27-28, from 9:00 till 16:30. The CBL course was designed by Professor Sr Edith Raidt, a Schoenstatt Sister, and draws from the teachings of Fr Kentenich, who founded the Schoenstatt movement. German Pallottine Fr Kentenich, who died in 1968, was a theologian, educator and pioneer of a Catholic response to several modern issues. The seminar will be presented by clinical psychologist Tony de Gouveia and human resources professional Francis Graham. The cost is R1 800, which includes course material, notes, lunches, and tea. n For more details, contact Helen Hartwig on h.hartwig@staugustine. ac.za or call 011 380-9000. Become an Associate - Your contribution makes a difference The Associates Campaign is an integral support to The Southern Cross ensuring that it continues its apostolic outreach, developing the means of transmitting our Catholic values in the new forms of media and safeguarding its future in these uncertain economic times. • Safeguard the future of The Southern Cross. The Associates Campaign is a bedrock in which the existence of The Southern Cross is rooted. • Enable us to develop our presence on the constantly evolving technological platforms to meet young Catholics where they are. This is a substantial but absolutely essential undertaking which our income from sales and advertising simply cannot cover. • Support our apostolate to prisoners to help them convert to a life with Christ. As St Paul admonishes us: “Keep in mind those who are in prison, as though you were in prison with them… since you too are in the one body” (Heb 13:3). Our outreach currently serves 24 prisons as well as six army bases; it is funded entirely by the Associates Campaign. • Ensure that all our seminarians may have access to The Southern Cross so that they remain in touch with the events and thinking of the local and worldwide Church. • Help us give young journalists a foundation in religious reporting at a time when the secular press covers our Church only in relation to bad news. compiling the document, said the Church and the local community had become quite concerned at the high number of deaths and injuries resulting from road accidents. “Prayer meetings such as the one today have become annual events of pain and bitterness as we remember our own loved ones who have died or sustained serious injury in this scourge,” he said. Fr Xhamlayo argued that among the three main causes of road deaths—the human factor, road conditions, and vehicle conditions—the human factor was the most important as it was the common denominator in all of the others. Accordingly, the guide document has come up with eight strategies for road safety, most of which are targeted at changing human behaviour. These include ensuring road safety becomes a daily topic of conversation in homes; providing the community with accurate and upto-date information/statistics on road safety issues; positive and negative social reinforcement measures for road behaviour (for example, holding best taxi driver competitions); and fighting society’s widespread tolerance for the “scandal of annual road deaths and bad behaviour on our roads”. Bishop Sipuka thanked all who had helped make the guide a reality. He said it was only a first draft and proposed that further refinement of strategies should include the Church making road safety an integral part of Sunday School teaching. The music department at Holy Rosary School in Edenvale, Johannesburg, held its bi-annual soirée. Pupils and parents got to enjoy the performances by talented young women. Pictured are students Rea (French horn) and Xongi (guitar). face painting and target shooting, among other things. Visitors will also stand a chance to win prizes in lucky draws and raffles. Those who would like to have private stalls on the day or wish to make a contribution towards the event, are asked to urgently contact Zama on 011 609-7246 or at office ad@littleeden.org.za for more information. The lArgEST Catholic online shop in South Africa! we specialise and source an extensive variety of products, some of which include: *Personalised rosaries *Priest Chasubles *Altar linen *Church items *Bells *Chalices *Thuribles *Personalised Candles, etc. Tel: 012 460-5011 | Cell: 079 762-4691 | Fax: 0123498592 Email: info@catholicshop.co.za 2øæ­¸Ø "ı̇øßº̋ø̋¸"¬Æß̶" "
Clerical shirts, Cassocks, Server Robes, Choir Robes, Habits, Albs, Surplices, Cottas, etc. lieving in God’s existence and love for him. This experience, which he would later attribute to his wife’s tireless prayers on his behalf, led to a complete transformation of his life. After a difficult 17 years of marriage, the relationship was united in a new fidelity and they grew in faith and joy together. In 1989, Cyprien and Daphrose encountered the Emmanuel Community, a Catholic organisation with an international presence, focused on discipleship and evangelisation through prayer and charity. The following year, they founded a chapter of the community in Rwanda. Over the next four years, they devoted their time to the quickly growing community. But while the Rugumbas’ marriage was filled with joy and peace, the country around them was not. Decades of ethnic tension were beginning to lead to calls for violence in Rwanda, fostered by propaganda backed by political extremists. (as in Sharpeville) and political activists (such as Steve Biko or Neil Aggett, to mention just two of the many). That said, the African National Congress should not be allowed to emotionally blackmail its critics by accusing them of â&#x20AC;&#x153;missing slaveryâ&#x20AC;?. The ANC, along with other forces constituting the liberation movement, has led South Africa out of slavery but it has done a terrible job of ushering in a better world. To blame those who feel betrayed is to blame the victims. Having been abused by oppressors, many South Africans have become victims of their liberators in the form of the looting of state resources, taking away money meant for water, sanitation, electricity supply and other amenities which would make life easier. If the ANC really wants to play with religious imagery, it may wish to look at the prophet Amos and what he had to say about those who use their power for their own selfish ends and to oppress the marginalised. â&#x20AC;&#x153;You trample the poor, stealing their grain through taxes and unfair rentâ&#x20AC;Śyou who rob the poor and trample down the needy. You cannot wait for the Sabbath day to be over and the religious festival to end so you can get back to cheating the helplessâ&#x20AC;? (Amos 8:4-5). If the people are behaving like the thankless Israelites, it is because the wandering in the desert is self-imposed. It is a result of the partyâ&#x20AC;&#x2122;s reluctance or inability to deal with those who have seen it as a path to self-enrichment. If Easter, specifically the Passover, celebrates a peopleâ&#x20AC;&#x2122;s passing over from political oppression to freedom, then far too many South Africans are trapped in a desert of hunger, violence and limited opportunities. Like the disciples on their journey to Emmaus, who despairingly tell the stranger walking with them that they â&#x20AC;&#x153;had hoped that he was the one to redeem Israelâ&#x20AC;?, far too many South Africans are walking down the streets with heads bowed by despair because their hopes have been dashed. And, 25 years later, there is no sign of Easter coming. n Fikile Moya is a leading South African journalist. The Editor reserves the right to shorten or edit published letters. Letters below 300 words receive preference. Pseudonyms are acceptable only under special circumstances and at the Editorâ&#x20AC;&#x2122;s discretion. Name and address of the writer must be supplied. No anonymous letter will be considered. Bring back the church bells! 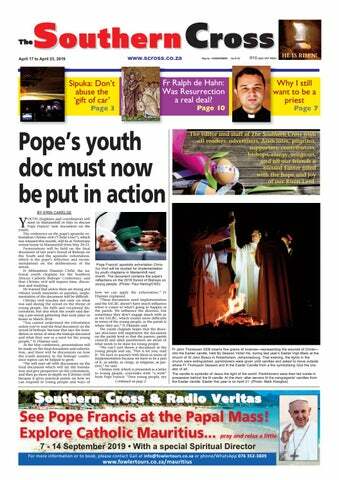 can help in the education of South Africans for the PriESThOOD at St Josephâ&#x20AC;&#x2122;s Scholasticate, Cedara, KwaZulu-Natal. tions, on the fourth Sunday of Easter. As seminarians we were invited to parishes to share our vocational stories with young people. Very often it was discovered that most of us served at the altar and that this was monumental in discerning the call to priesthood. one applies to the diocese, for instance, the vocations director and the bishop will ask why you want to become a priest. Even in the seminary, formators will continuously ask the same question, with different emphases at the various stages of formation. The new Ratio Fundamentalis (or “The Gift of the Priestly Vocation”) on formation of future priests, issued on December 8, 2016, by the Congregation for the Clergy, considers the period when one studies philosophy in the seminary to be the stage of discipleship, or following Christ. After that, the years of theological studies is the stage where one strives to become configured more closely to Christ. The discernment of the priestly vocation will therefore focus on these aspects and later, after seminary formation and while preparing for ordination to the priesthood, the emphasis will be on pastoral synthesis of what was learnt in the seminary. Thus, foundational experiences of the call, as altar servers or members of parish youth groups or sodalities of Our Lady, are developed, sometimes purified, to ensure that aspirants develop a priestly identity, after the heart of the Eternal High Priest, Jesus Christ, equipped for the mission of evangelisation. Perhaps the question nowadays, given the clergy sexual abuse scandal, will be: “Why do you still want to be a priest?” This could very well be a daily question, since discernment, for the disciple of Christ, is a lifelong task. Happiness is not easy to find, but it shines through the thickets of life. in volume as my bank balance diminishes. But what is happiness and where are all the happy people? Is it a day or week at school or work void of any frustrations? Is it when things go according to plan? One can definitely hope so. I am not an expert on how to be happy, but I am well-experienced in the field of not being happy. Strangely enough, our happiness is not found in clinging on to things, beautiful though these may be. If it were so, then all that is necessary for human happiness is to abandon all relationships in the pursuit of material wealth. This, of course, isn’t so. ford that. The happiest people, I have found, are the ones bold enough to give a part of themselves away, whether in serving the poor or in marriage. Our human nature always desires a gift in return for what it gives. Many of the great saints, like St Francis of Assisi 800 years ago or St Gianna Berretta Molla 60 years ago, understood this and used it as a path to find God. They understood that to have everlasting happiness, a sacrifice must be made. During Lent we sacrificed many of our comforts in order to grow closer to God. We gave up gluttony for temperance, pride for humility, wrath for patience, envy for gratitude, lust for chastity, and sloth for diligence. Jesus himself gives away life so that others may live! The saints, once their lives of sacrifices had been made, found their way to a place where they could feel the warmth of the sun upon your back, where their eyes behold the glow of light on the leaves of a tree. They gaze upon a sky as blue as tanzanite. There where the warm breeze flows, where the sky is clear with no clouds passing by, they have happiness that is as bright as when the sun shines. ERHAPS your misunderstanding was of the meanings of the word “communion”. When we commit a serious sin we know from our catechism that we may not go to Communion worthily until we have repented for that sin and had it absolved in the sacrament of reconciliation. The Catechism (1385) refers us to 1 Corinthians 11:27 where St Paul urges us to examine our conscience because whoever eats the bread or drinks the cup of the Lord in an unworthy manner will be guilty of profaning the body and blood of the Lord. Catholics who remarry without a valid annulment of their first marriage are regarded as committing the sin of adultery. Leaving aside the pastoral care and sympathy the Church gives to such individuals, they may not receive Communion because of their ostensible sin. Note that they would equally be unfit to receive Communion if they had done grave things like murder or unjust and abusive treatment of others. The point is that such sinners remain members of the Church and the sacrament of reconciliation is available to them. In cases of excommunication, the word “communion” is applied in a similar but different sense. It is similar because the sacrament of the Eucharist expresses the members’ communion with the rest of the Church. It is different because excommunication deprives a Catholic of all the rights of membership of the Church, including Catholic burial. Among those rights is also the freedom to go to Holy Communion among the “communion of saints”. Way back in time the Church imposed the censure of excommunication in various ways, many of them dreadfully harsh by today’s standards. In our time, excommunication is relatively rare. Canonical excommunication is not something that can be explained simply, because the law allows for at least two ways that it can be incurred. The first way is when the law itself imposes it automatically, say in the case of abortion or the desecration of the Blessed Sacrament. The other way is when it is imposed by the sentence of ecclesiastical authority, for example after someone persists in spreading heretical teachings and ignores warnings to stop. Each case has its own particular circumstances and the Church takes these into account when it prepares to lift the penalty. Excommunication from membership of the Church is known as a “medicinal” censure because its aim is to give the delinquent the opportunity to repent and return to the fold. wishing all a happy and Blessed Easter! Sacred Heart College in observatory, Johannesburg, held a Read Aloud Day, with parents reading to foundation phase learners. Brescia House School in Bryanston, Johannesburg, and Ipanema joined to collect more than 600 pairs of unwearable flip-flops. Flip Flop Sculptures’ employees turned them into art and functional products for sale. Brescia House students who helped in the project were (from left) Isabella Loureiro, Scarlett Kzychykiewicz, Hannah Collins, Angela Dietrich, Palwa Njamu, and Saphokazi Zweni. Marist Brothers Linmeyer in oakdene, Johannesburg, awarded Grade 12 students with colours and honours blazers at assembly. (Left) Luke Harding and (right) fellow Grade 12s honoured (back from left) Alicia Sequeira, Brad Gunther, and Callista Kalil, and (front) Michaela Amaro, Andrea Quebra, Micaela Rodrigues, and Kabelo Makume. Holy Family College in Glenwood, Durban, celebrated 144 years with a birthday Mass attended by Cardinal Wilfrid Napier, Frs Ngubane, Neville, Lafferty and Henriques, and Holy Family Sisters. Distinguished guests included Catholic Schools office director Lionel Samuels, the Department of Education’s Mr Singh, principals, parishioners, past pupils, teachers, those on the board of governors, members of the PTA, staff and Holy Family College students. The birthday cake was sponsored by Glenwood Superspar. Is this the true Holy Grail? Senior school students and staff at CBC St John’s Parklands in Cape Town organised a cyclothon to raise funds for operation Smile, which organises surgery for children with cleft lips or palates. More than R22 000 was raised. Pictured cycling are staff members Maryke Vazirgiantzikis, Marisa Fox and Carin van Graan. At Easter, we can rise again Easter invites us to overcome our own Calvaries and find strength in Christ on our way to salvation, writes TSHIAMo STEPHEN TAKoNGWA. Frail/assisted care in shared or single rooms. Independent care in single/double rooms with en-suite bathrooms. Rates include meals, laundry and 24-hour nursing. Day Care and short stay facilities also available. message of Easter. Our faith has changed the way we live our lives today. Whenever we are forgiven our sins, we experience the new life of the risen Jesus. A typical example is Peter’s triple denial of Jesus. Encountering the Risen Christ, he repents and is forgiven (Jn 21: 15-17). “Everyone who believes in Jesus has forgiveness of sins through his name” (Acts 10:43). In the Gospel of Mark we read that after the resurrection, Christ instructs his disciples to go to the whole world and proclaim the Gospel to all nations. At the heart of the Gospel is the teaching that we too must share in the paschal mystery—not only when we are baptised and come to Mass on Sunday but also in our daily lives, so that we can experience the new life of the resurrection. New life in Christ We often experience this new life of the resurrection when we are able to pull though our own personal Calvaries, such as relationships problems, unemployment, depression, stress and so on. Even though we reach the lowest depths, we need to be able to put our trust and faith in Jesus Christ, and then we shall experience an inward peace. That inward peace we experience, that’s the rising of Jesus again in our own lives! We experience this new life of the resurrection when by sheer persistent endeavour we are able to overcome even permanent physical handicaps and live our lives to the full. We are the Ursulines Sisters of the Blessed Virgin Mary, caring for the sick, education and pastoral work. Do you feel called? Contact us !!! We experience the new life of the risen Christ not only as individuals but also as a community of believers. Whenever the community experiences that brokenness, there is also the possibility of experiencing communal resurrection. Our communities are experiencing violence, injustice, discrimination, inequality and more. This shows how the world is broken. But there are people in our communities, full of the power of the Holy Spirit, who have put up a peaceful fight against injustices in our society and who hope in Christ so that he will bring them through those Calvaries to the new life of the resurrection. God’s will is that “all men to be saved and come to the knowledge of the truth” (1 Tim 2-4). He gave us the Gospel with its truth, the Church with its teaching, the sacraments with their grace, and the pope as his representative on earth as the means to be saved. The Church, we might say, is like Noah's ark, a refuge from the waves of sin. The apostles of Jesus were commissioned to go out and preach this Gospel and baptise those who believe the Good News “in the Name of the Father and Son and the Holy Spirit”. Let us respond positively to this call. Let us open our hearts to God because he is the one who will read our hearts at the end of life. Let us hope that he will find us worthy of the resurrection in his kingdom of glory. n Tshiamo Stephen Takongwa writes from Gaborone, Botswana. Was the Resurrection real? Was the Resurrection of Christ real? FR RALPH DE HAHN explains why it was real, and what it means to us today. prophecies had been fulfilled: “All is now consummated!” (Jn 19:30). As believers, we know that with his death—and all that followed— the divine plan of salvation was complete. But was there a bodily resurrection? Millions of sceptics—even among good Christians—cannot easily accept the biblical teaching that there was such a resurrection. But the historical evidence from biblical and Roman records is staggering. Something out of the ordinary happened! Luke records the big surprise: “On entering the tomb, the women with the spices found that the body of the Lord was not there” (Lk 24:1-4). We recall that his disciples trembled with fear when their leader was arrested in the Garden of Gethsemane, condemned and crucified on Golgotha. In fact, they betrayed him (Mt 26:30-35). But then, after those few days, came that unpredictable transformation among the disciples. Something had happened! Apostles speak out Standing courageously before the Jewish tribunal, these disciples boldly profess their faith in the Risen Lord, claiming they were now speaking in the temple of what they had seen and heard. “And we are witnesses to all this, we and the Holy Spirit whom God has given to those who obey him” (Acts 5:31-33). The change was indeed incredible for nobody is prepared to die for a lie! The disciples had not foreseen this happening, despite all that Jesus had foretold. On the other hand, the Sanhedrin’s authorities were prepared to set a guard over the grave of a dead man. But not the apostles! Now why was that? Jesus had to convince his own disciples of his bodily resurrection. He appeared to them on a few occasions with his human yet glorified body, and asked: “Have you anything here to eat?” (Lk 24:4043). A dead man has no need of food. We probe further. Did John’s gospel not record Jesus saying, “No one takes my life from me...I have power to lay it down, and I have power to take it up again”? (10:18) Jesus also made this promise: “In a short time you will no longer see me, and then in a short time later (on the third day) you will see me again” (Jn 16:16). He also mentioned the grain of wheat that had to fall into the ground and die; only then would it produce a rich harvest (Jn 12:2324). The book of Revelation would declare: “I am the first and the last, the Living One. I was dead and now I am to live forever”(1:17-18). And he shall come back again as “King of kings and Lord of lords” (Rev 19:16). And he will fulfil his promise to his disciples: “I am going away to prepare a place for you, but I shall return to take you with me, so that where I am you may be too” (Jn 14: 2-3). The apostle Paul, a convert to Christ who had previously persecuted the Lord’s followers, testifies to the death, burial and Resurrection of the Lord. The risen Christ appears to the disciples in the upper Room, as depicted in the basilica of Sant' Apollinare Nuovo in Ravenna, Italy. All his epistles are centred around the core truth of the Lord’s Resurrection: he suffered so much to proclaim it (1 Cor 15:3-8). To the Colossians he writes: “He was first to be born from the dead so that he should be first in every way, and all things to be reconciled through him and for him” (1:18-20). Holy Land & Oberammergau Passion Play Performed only every 10 years! Advance registration is required. Please contact Brian Robertson at brian.r@mweb.co.za or 072 118 2149.
lege of London, secondary teachers’ training at the training college in Bulawayo, and a BA degree with Unisa in Pretoria. She taught for two years in the Sacred Heart Home, Bushtick, and for four years at the Regina Mundi Girls’ High School. Throughout her life Sr Dorothe cherished fond memories of Zimbabwe. Vigil: The eve of a religious festival observed by special prayer services and devotional exercises. Traditionally this has occurred for the major feasts of Easter and Christmas. Evangelist: One of the four authors of the Gospels (Matthew, Mark, Luke and John). More generally, someone who works actively to spread and promote the Christian faith. Vestments: Garments worn by those celebrating Mass or administering sacraments (for example, alb: long white tunic; chasuble: main outer-garment; stole: type of scarf worn around the neck). The stole is the principal symbol of ministerial authority and is worn by deacons, priests and bishops when administering the sacraments. Magisterium: The teaching office of the Church, articulated by a pope. Papal statements which teach on a matter of faith and morals are called magisterial pronouncements and are binding on Catholics. Most statements and documents of popes are not magisterial. cate of keeping the school running, even during the times of political upheaval. Sr Dorothe was an active member of the Mariannhill CPS community, occupying various leadership positions, including ten years as provincial superior, from 1995 to 2005. After her second term as provincial had come to an end, Sr Dorothe offered to go to the Sacred Heart Home in Ixopo. The new administration asked her to act still as its legal representative in matters of land affairs, as a trustee of St Mary’s Hospital and a CPS representative on the board of Little Flower School in Ixopo. She also taught the Church and the congregation’s history to first-year novices. In 2013 Sr Dorothe was transferred to Mariannhill where she taught English to new candidates of both the CPS and the Congregation of Mariannhill Missionaries from other countries. Sr Dorothe was not well in her last years. In March 2019 she was admitted to the Mariannhill infirmary and three days later to Hillcrest Hospital where a brain tumour was diagnosed. Kind, caring and cheerful, Sr Dorothe was a gifted person who gladly shared her knowledge. She wrote occasional articles for the Mariannhill magazine and thank-you letters to benefactors. She had a great love for the liturgy, and felt a strong sense that God was her support in good and not so good days. Anniversaries • Milestones • Prayers • Accommodation • Holiday accommodation Personal • Services • Employment • Property • Parish notices • Thanks • others Please include payment (R1,90 a word) with small advertisements for promptest publication. BROWN—William Christian. In loving memory of our father and grandfather who passed away on April 13 , 2004. Years may have passed but you are always in our thoughts and constantly in our prayers. Lovingly remembered by Ruben, Gloria and family. HOUGHtON—Agnes. Loving wife of the late Bill and mom of the late Mary, passed away on April 23, 2014. Lovingly remembered by her daughters Margaret, Bridget and Barbara, sonsin-law Walter, Derick and Ben, grandchildren and great-grandchildren. May her dear Soul Rest In Peace. NeW PARISH NOtIceS MOSt WelcOMe: If any parish notices listed are no longer valid, call us on 021 465-5007 or e-mail us at m.leveson@scross.co.za so that we can remove them. Southern CrossWord solutions SOLUTIONS TO 859. ACROSS: 1 Ezra, 3 Assemble, 9 Teacher, 10 Ingle, 11 Unscriptural, 13 Elisha, 15 Be seen, 17 Misadventure, 20 Ailed, 21 Nascent, 22 Absentee, 23 Idle. DOWN: 1 Enthused, 2 Reaps, 4 Seraph, 5 Epicureanism, 6 Big name, 7 Ever, 8 Churchwarden, 12 Ungentle, 14 Icicles, 16 Avenue, 18 Up-end, 19 Cana. We welcome prayers, volunteers and donations. The Southern Cross is a member of the Audit Bureau of Circulations of South Africa. Printed by Paarl Coldset (Pty) Ltd, 10 Freedom Way, Milnerton. Published by the proprietors, The Catholic Newspaper & Publishing Co Ltd, at the company’s registered office, 10 Tuin Plein, Cape Town, 8001. 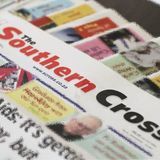 Opinions expressed in this newspaper do not necessarily reflect those of the editor, staff or directors of The Southern Cross. who are prostrate—and in that prostration symbolically doing him reverence. And the symbolism continues: Jesus is sentenced to death at noon, at the exact hour when the priests began to slaughter the paschal lambs. After his death he is buried with a staggering amount of myrrh and aloes, as only a king would have been accorded, and he is laid in a “virgin” tomb (just as he was born from a virgin womb). John makes it clear that this is God we’re dealing with. With this in mind—namely, that Jesus was always divine and in charge—we will be able to understand more clearly what John is trying to teach in his account of Jesus’ death. What John focuses on most is the trial of Jesus. The bulk of his passion story is centred on the trial and the main characters in that trial. claim to have “seen the Lord”, he expresses his disbelief in the crudest possible terms: “Unless I see in his hands the mark of the nails and throw my finger into the mark of the nails and throw my hand into his side, no way am I going to believe.” Inevitably he gets his comeuppance just a week later when once more Jesus penetrates the locked doors (so they were still very fearful), and addresses Thomas, offering him precisely the evidence he had been asking for. The evangelist does not tell us whether he accepted the invitation; instead we learn that he went far deeper, and, as the climax of this extraordinary Gospel, addresses Jesus (and we applaud as we listen) as “My Lord and my God”. Then he is mildly rebuked: “You have come to believe [only] because you have seen”; meanwhile you and I are congratulated: “Happy are those who have not seen and [yet] believed.” There is the challenge for us: to “believe that Jesus is the Messiah, the Son of God, and that believing you may have life in his name” That is what is on offer for us, in this Easter season. namely, his belief (however sincere) that he could treat truth and faith as realities that he, himself, could steer clear of, that he could assess these from a neutral, non-committed position, and that these were other peoples’ issues, nothing to do with him. But he’s judged for this. Nobody can coolly ask: “What is truth?” as if that answer didn’t affect him or her. Jesus’ trial finds Pontius Pilate, and those of us like him, guilty—guilty of agnosticism, a noninvolvement, an indifference that is in the end dishonest. Ironically, Pilate’s weakness in not rescuing Jesus ends up making him perhaps the most famous governor and judge forever in history. With his name in the Christian creeds, millions and millions of people pronounce that name every day. But Pilate isn’t alone on trial here; so are the religious authorities of the time. In their very effort to protect God from what they deem irreverence, heterodoxy and blasphemy, they are also complicit in “killing” God. The judgment made against them at Jesus’ trial is the exact judgment that is being made, down to this very day, on a lot of religious and ecclesial authority—that is, its fervid proclivity to protect God often helps crucify God in this world. Last, not least, Jesus’ contemporaries are also on trial and, with them, so are we. In the heat of the moment, caught up in the mindless energy of a crowd, they abandon their messianic hope for the slogan of the day: “Crucify him!” How little different from so many of the political and religious slogans we mouth at political and church rallies today. The trial of Jesus is a very harsh judgment on the mindlessness, fickleness, and dangers of crowd energy. The genius of John’s account of Jesus’ death is that it shows what happens whenever through our misguided religious fervour or through our cool agnosticism we put God on trial. It’s we who end up being judged.